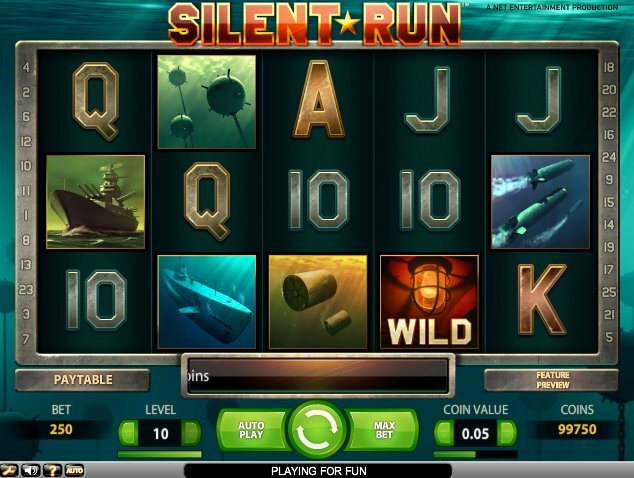 If you’ve enjoyed the thrills of NextGen Gaming’s adventure-themed slot, The Bermuda Mysteries, with its emphasis on lost subs and ships, or the wacky adventures of underwater-themed slot from NetEnt, Subtopia, you should get a kick out of the Cold War-themed game from the same developer, Silent Run. Immersing (see what I did there?) 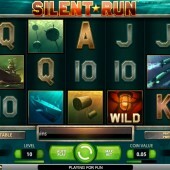 itself in the undersea world of superpower subs, this 5-reel, 25-payline online slot has similar “super powers” with its slick graphics, neat animation, torpedo whooshes, and interesting features. Betting starts at just $0.01, but with a maximum bet of $125 per spin, it doesn’t exclude all but the biggest bettors. As well as the subs on the reels – and we aren’t talking about the cheese and ham with extra jalapenos variety – we get plenty of battleships, depth charges, mines, torpedoes and those sonar symbols. Naturally there are some naval-looking chrome-effect 10-through-Ace symbols to fill things out a bit. The red light symbol acts Wild and will substitute for all regular symbols other than the echo bonus Scatter and special echo Wild. The echo Wild only appears on Reel 3, but when it does crop up, it sends out three sonar pings trying to find hidden Wilds. The green echo bonus symbol, meanwhile, also appears on Reel 3. When it appears on the third reel it sends out three pings trying to find torpedoes. Each ping can find up to five torpedoes. You’ll then go to a separate game-screen where you have to fire your load (hurr hurr) into enemy territory. With each ship you hit you win cash prizes. Multipliers of anything from 1x-10x will be applied to your wins. There’s no doubting Silent Run’s atmosphere, and the bonus round and hidden Wilds are both neat touches. However, it does require you to hit one reel, and one reel only, so you do find yourself focusing on Reel 3 quite a lot in order to bag big wins. A free spins round would have been a nice addition, but nitpicking aside, renowned slot developer NetEnt have come up trumps yet again.